When you look at the current condition of the United Sates economy, it won’t take you long to figure out that it’s seen better days. The economic hardships that the country is currently undergoing influence each state, county, and city within, down to even the smallest communities. These effects stretch far beyond the dip in the average weekly paycheck. American towns, much like the well-known Jacksonville, Florida, are also seeing increases in violence, unemployment, and overall community morale. A logical place to start the journey in eradicating these issues would be the healthcare industry, especially considering it has been named the fastest growing industry in today’s economy. In simpler terms, healthcare is the gold-mine of the average 21st-century American community. One man has certainly been doing his part to improve his community, and his name is Dr. Albert Chester. There’s been a lot of buzz, lately, surrounding that name, and the name of the institute that has recently launched in the Jacksonville community, The Capstone Institute. 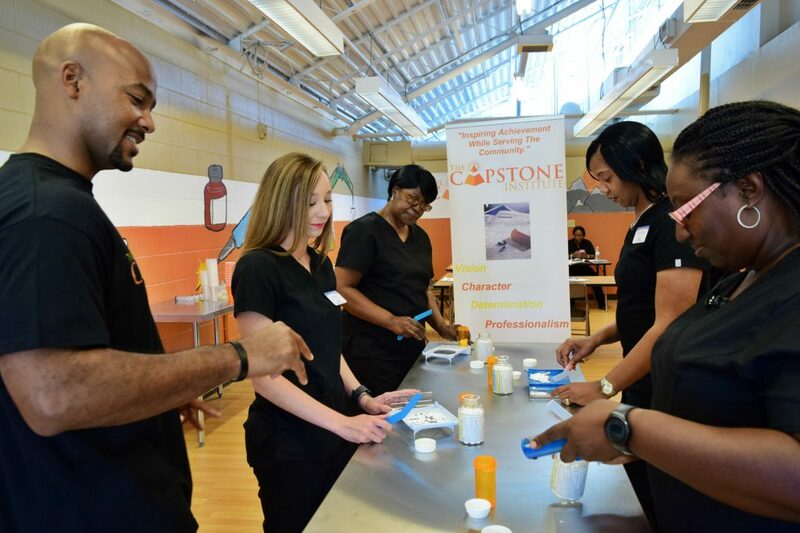 The Capstone Institute is a pharmacy tech school that, according to Dr. Chester, doesn’t only strive to train students to become employed as pharmacy technicians, they strive to develop future leaders that will affect positive change in the community. In his eyes, any university or tech school can train someone to be a decent employee, but it takes special care and passionto train someone to be a leader that thinks outside of the box, inspires change, and pushes their community into a positive direction…the latter is the type of experience that The Capstone Institute aims to provide. What better time to launch such an inspiring project than right now, when the community is a low point, alongside many other American communities? Lieutenant Colonel Ricky L. Pope, USA (Retired), seems to believe that there is no better time. He recently stated: “The Capstone Institute is another ember on the fire of progress within the community. We must continually support such ventures so that the fire will grow stronger”. Dr. Chester agrees because from what he has seen throughout the first session of The Capstone Institute, the community is already responding well to the education and support that the institution is offering. It is worthy to be noted that all demographics within the community are being affected in a positive way by this new institution, as well as the new way of thinking that it has brought to the citizens of the Jacksonville community. The first class at The Capstone Institute consisted of individuals aged 22 to 56. This is just one of the many indications that The Capstone Institute is sparking inspiration and interest of members of the community across all generations. This is a good thing, considering it will take the wisdom of the older generations in combination with the energy and passion of the younger generations to not simply inspire, but establish in the Jacksonville community and surrounding areas. Speaking of which, Dr. Chester has proudly announced that he does plan to expand this program outside of the area in which it currently resides. “In 2018”, he says, “we are looking to expand further into Jacksonville, Florida, as well as branch off to other main cities in the state and southeast region.”. It is a refreshing thought for many Americans that an institution with such high aspirations and community support may be coming to a city near their own in the upcoming years. It is the responsibility of the community, within Jacksonville as well as hundreds of miles away, to ensure that this institution, along with the many others that are popping up around the country with similar values, can expand and inspire every individual that is within their capabilities. As the founder himself, Dr. Albert Chester, has said: “The opportunity to change the community must come from within the community.”. If you feel the need to support, or even get more information on, The Capstone Institute, as well as the difference they are making in the lives of their students and sponsors, you’re invited to visit www.thecapstoneinstitute.org or visit The Capstone Institute locally at 3416 Moncrief Road, Suite 101, Jacksonville, Florida 32209. If neither of these contact options are suitable for you, then you may also contact the institute through email at albertdchester2@yahoo.com or by phone at (904)-993-1800. We encourage you to support this organization, and we also encourage you to inspire change in your community, however you deem possible.